The waiver wire is an unforgiving place when you need a quarterback or tight end. Most startable quarterbacks are already on rosters, in leagues of all sizes. Tight end is tough for other reasons. There are a lot of players each week who will put up starter-worthy numbers, but they are often tight ends that nobody is looking at. 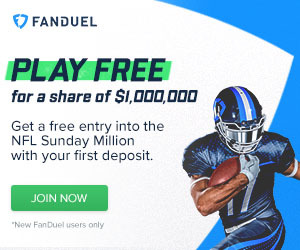 Whether you lost Roethlisberger last week or your tight end is not cutting it, here are some options to make it right. Derek Carr wants to make your team number 1. While the first instinct of most players is to not trust a young quarterback, Carr is quickly earning trust. This is not the stagnant, boring Raiders offense of the past anymore. The silver and black have legitimate playmakers on offense and they are starting to make some noise. Latavius Murray is running effectively and taking some pressure off the passing game. Meanwhile, Carr has two professional-quality receivers for once. Amari Cooper is a stud and should be a big time receiver for years to come. Michael Crabtree is a proven veteran who is just working his way back into form. 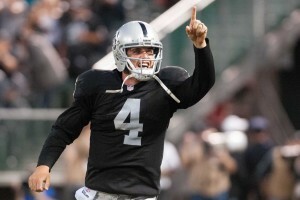 Carr should be a solid option for most games this season and is easily worthy of a starting spot. Despite being sloppy and generally not the best quarterback, Fitzpatrick does have his place in fantasy. This is a pickup that comes with some caveats as the Jets would love to run the ball if given the opportunity. So far their run game has not been enough on its own to carry the team. Fitzpatrick is not afraid to attempt any throw, even ones that he should not make. Luckily for him, he has some quality options on the roster with him. Brandon Marshall is a bonafide number one receiver. When Eric Decker is healthy, the passing game opens up even more and makes Fitzpatrick a decent option. This is not a quarterback that I would feel great about starting, but when the matchup is right he can rack up some points. Vick is another quarterback that I don't feel great about, but he just has too many weapons to not put up numbers. Antonio Brown and LeVeon Bell on the field at the same time mean trouble for opposing defenses. After one more week, the Steelers will also get Martavis Bryant back on the field. If Vick cannot find a way to put up points with the type of options that he has in Pittsburgh, he should retire. Williams may still get the chance to live up to the preseason hype. 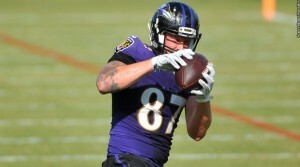 The Ravens rookie tight end was hyped in the preseason before taking a seat to Crocket Gillmore. Now it looks like Gillmore may not play on Thursday versus the Steelers and it may be Williams's coming out party. Flacco has targeted tight ends quite a bit, though it has mostly been Gillmore so far. The Steelers have a weak defense and that should mean that the Ravens can score some points. I don't know that this pickup will make sense for the long term, but if you stream tight ends or play DFS Williams should be the man for week 4. Barnidge is a buzzy name after his big week 3 performance. I don't think that he will regularly be putting up that type of stat line, but he is obviously the top pass catching tight end on the Browns roster. He has the trust of Josh McCown, so as long as he is starting Barnidge is worth a look. Although he is never going to put up big yardage totals, Daniels has distanced himself further from Virgil Green in the passing game. Daniels played 60 snaps to Green's 15, this is a clear separation. His value is going to be heavily tied to touchdowns, but the Broncos passing game is coming to life a bit. Daniels is a desperation play and not what I thought he would be going into the season, but he'll put up respectable totals some weeks.